Rendering of renovated Museum Medical Tower. HOUSTON – The Museum Medical Tower, near Houston’s Hermann Park, is undergoing a $10 million renovation. The 177,476-SF medical office tower is on the north side of the Texas Medical Center at 1213 Hermann Drive, near Park Plaza Hospital and the Museum District. HCP Inc., the building owner, engaged Cassetty Architecture of Hendersonville, Tenn. to design the renovation. HCP owns more than 2.5 million SF of medical office space in the Houston area. Scott & Reid General Contractors of Dallas is the general contractor. Vice Presidents Ashley Cassel and Justin Brasell in Transwestern’s Healthcare Advisory Services group provide leasing services on behalf of HCP. 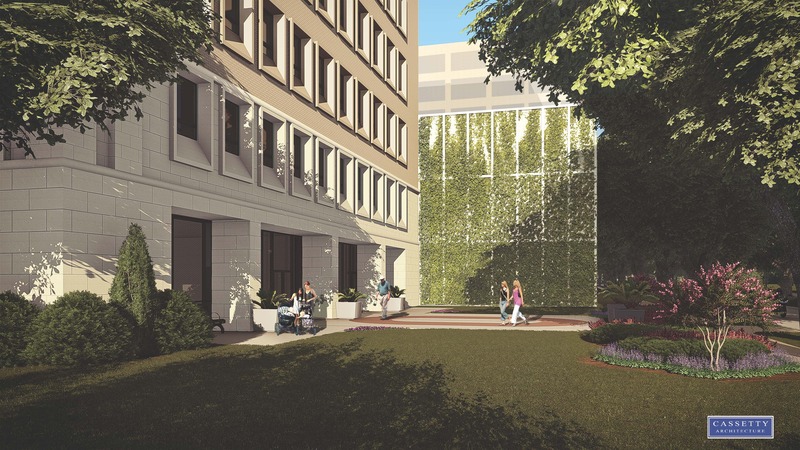 Exterior renovations will include a new French inspired façade and main entrance, a live green wall feature, new landscaping, sidewalks, and parking garage updates. The building interior will receive completely new lobby finishes, as well as upgrades to the corridors, elevator lobbies and restrooms.